The most impressive encounter with this monastery is at daybreak. If you happened to set forth from Strumica by car half an hour before sunrise, after having driven some ten kilometres to the northwest of the city, you already climb up the winding narrow road above the Village of Veljusa, and there... you find yourself in front of the monastery gate. Around you there is the rural atmosphere of a Macedonian village that slowly wakes up. Dogs barking and roosters; smell of country yards and hen-houses, of chimneys and firewood that bring to mind images of breakfast being prep ared. The area does not abound in vegetation. Nothing that would especially attract a new-comer's attention at his first visit here. You are much too close to the monastery as to see it. Knowing not what is on the other side, you cautiously step in through the gate... and then everything changes. All you hear is the echo of your footsteps on the stony path and the wind in the crowns of the trees, while in amazement you feel the gentle eastern light and the peace this place breathes with as they tame you. An oasis... of silence. Greenery bordered with flower-beds and roses. Recently planted trees. With great care and love laid out park, in which dominate the ancient church and several newly built monastery facilities in the characteristic Macedonian-Byzantine style of construction – dressed stone and brick. An elevated sight. 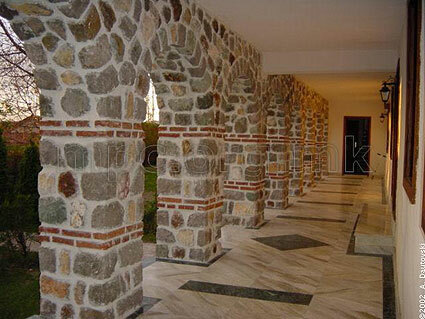 The monastery complex is situated on a rocky plateau above Veljusa and the Strumica Valley . Behind the mountain ridges of Ogražden the sun rises. The clock tower shows the time that passes down there in the world, and here – it stops, in a 'momentum towards Eternity'. And while you wonder if you were all alone in this celestial sight, quietly opens the gate of the monastic part and several nuns soundlessly go down the steps toward the entrance into the church. Spontaneously you follow them and you are already inside... It is time for Liturgy. On the lintel of the door to the church narthex there is a copy of the marble plaque with the founder's inscription from 1080, where it is chiselled (in Greek): "This church of the Most Holy Theotokos the Merciful (Eleusa) is built from the foundations by the monk Manuel, who became episcope of Tiberiopolis in the year 6588 (1080 AD) indiction 3". The second inscription, written in Greek as well, on the marble plaque (in the present a copy of the original) placed on the lintel of the entrance from the church narthex to the nave, reads: "Since I have placed my entire hope in You, O immaculate Mother and fountain of mercy, I, a shepherd, monk Manuel, Your servant, offer to You, Sovereign Lady, this church." During the First World War the originals of these two marble plaques were removed from their places by the competent Bulgarian authorities and taken to Sophia, where until now they have been exhibited in the Sophia Museum. About the church construction and its founder, Episcope Manuel, as well as about the order of spiritual life and generally about the daily catholic life of the first monks, we find original historical data also in the Rule (Typikon) written personally by him between 1085 and 1106. This is one of the oldest known typikons in the history of Orthodox monasticism, which is a witness to the thousand years old monastic tradition in Macedonia. It is stated in it that the abbess (hegoumeni) of the monastery is the Most Holy Mother of God, whereas the superior (kathegoumenos) is given sovereign authority in the management of the property and the organisation of life. Protected with chrysobulls issued by Byzantine emperors, for a rather long time the monastery had an independent status, entitled to autonomous right to: all its possessions, election of its superior, and no interference in its internal affairs either by the Tiberiopolitan hierarchs, or by the local secular authorities, or even by the Ecumenical Patriarch, which is an exceptionally rare case in the history of Orthodox monasticism. After the 13th century, written documents give evidence that the Veljusa monastery lost its independence and became a dependency (metochion) of the Hagiorite monastery of Iveron until 1913. In the First Balkan War, the last Iveron's monks left the monastery not to come back ever after, taking with them all the sacred valuables from the church treasury and also the whole documentation. To the former magnificence of the Veljusa monastery, despite the emptied treasuries, bear witness the records of the church inventory drawn up in 1164, preserved in a copy from between the 13th and the 14th century: the description of 67 manuscripts, 35 icons, 17 royal charters, of the archival books, sacerdotal vestments, etc. The monastery church is the only present witness to all the changes the monastery has undergone from its beginnings onward, throughout its thousand years old history. In its ground plan this church is a four-apse building, with an octagonal cupola, as a rare edifice of such kind in Macedonia. It was built in 1080, and from then also date the narthex and the southern chapel, with the latter functioning as a vestry. In the rather damaged fresco painting, frescoes of two periods of origin can be distinguished. The first dates back to the time of the church construction – 11th century, with partly preserved frescoes in the altar space (the Theotokos nikopoia enthroned and hierarchs in the altar apse), in the nave (the Theotokos oranta flanked by St. John the Baptist and two archangels, the Old Testament Prophets, and Christ the Pantocrator in the cupola; 'The Meeting of our Lord' and 'The Descent of Christ into Hell' in the west and north apses, respectively), and in the southern chapel (St. Nyphon, St. Panteleimon, and Christ Emanuel). Frescoes of the second phase, from the 12th century, can be identified in the exonarthex on the west and north walls of the southern porch (the figure of St. Onuphrius is the only one preserved). In the church interior there are original fragments preserved of the oldest marble iconostasis and also fragments of the mosaic floor decorations. Just as a thousand years ago, with the arrival of the Venerable Manuel from the monastery of St. Auxentius, in the new wave of renewal of monasticism in Macedonia the Veljusa monastery has once again become a monastic nursery-garden. It all started with the arrival of the monk Nahum from the Gregoriou monastery on the Holy Mountain and his consecration into Strumica metropolitan in 1995. Until 1996 he lived with his monastic brotherhood here, and in 1996 after they moved to the Vodoča monastery, the Veljusa monastery embraced its first sisterhood. The first generation of monks and nuns who were tonsured in it has renewed ab out ten monasteries outside the Strumica diocese and five monasteries in the diocese itself. Today the Veljusa community consists of ten nuns of various nationalities (of Macedonian, Romanian, Croatian, Russian, Serb descent). The established typikon is coenobitic , with emphasis being put on the practice of the Jesus prayer. The day begins before dawn, when the sisterhood takes the first blessing from their superior, sister Sara, as they gather at a common brief synaxis , at which by reading counsels on the prayer, they prepare for the prayerful stillness in their cells until Liturgy. Visitors and the guests in the monastery can get in touch only with the sister-archontaris (guest master), whereas the other sisters while doing their monastic tasks cherish silence and continuous saying of the Jesus prayer. The monastery has developed an independent publishing activity: from 1996 onward around twenty titles have been published – translations from patristic literature, counsels of contemporary Elders, etc., as well as a music CD with the Liturgy of St. John Chrysostom. The sisterhood takes care of the editing of the official website of the Macedonian Orthodox Church. In the monastery sewing workshop the sisters makes unique vestments, decorated by hand with great care. Monastic handicrafts practiced here are embroidery of veils for the sacred vessels, parts of vestments, monastic schemas, and book markers; knitting prayer ropes and crosses; and mounting icons. The monastic refectory, the library, and the chapel of St. Gregory Palamas and of the Holy Apostle Paul within the monastic residential quarters were frescoed in 2002 by the sisters from the icon painting atelier of this monastery. Arranging the monastery park and taking care of it are also among the nuns' tasks. In the attempt to preserve prayerful peace, the monastic part is inaccessible to visitors, which are welcomed cordially and with evangelical hospitality in the guest quarters. Here they can get acquainted with the monastery history and life, taste the monastery products, have a look at the monastery handicrafts, take part in the Liturgy, seek prayerful support for themselves and for their beloved ones, living and departed. They can carry with them part of the peace and the blessing of this historically and spiritually important, holy monastery.